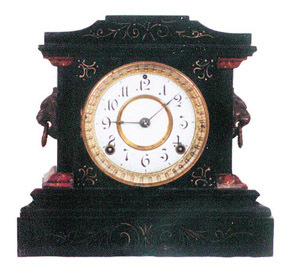 Ansonia Clock Co., enameled iron clock, "La France", ca 1880. Usually pictured with an urn or bust sitting on top. Red marble on the ends. Case is 11 inches high, and 11 1/2 inches wide. A "clock improver" person cut a slit in the wood base to access the pendulum. Evidently the 4 inch hole in the back wasn\'t adequate. 8 day, strikes hour and half hour on a gong. 2 piece porcelain dial is very good, as are the beveled glass, gilt sash and bezel. Complete with pendulum and back cover. Ly-Ansonia No.1000.